A kiss grind, also sometimes referred to as a “breeze grind” is a light surface grind that will remove minor surface damage. 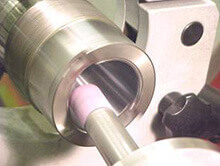 It is typically used on tool interface surfaces such as CAT or BT tapers. Because it is a grinding process it can only remove high spots. Often taper surfaces have high spots as a result of debris being pulled in during a tool change. This is a substantially less expensive repair than GPG. Because this type of repair allows the tool holder to sit slightly deeper into the shaft, it is not a solution for simultaneous contact tooling such as HSK or Big Plus.